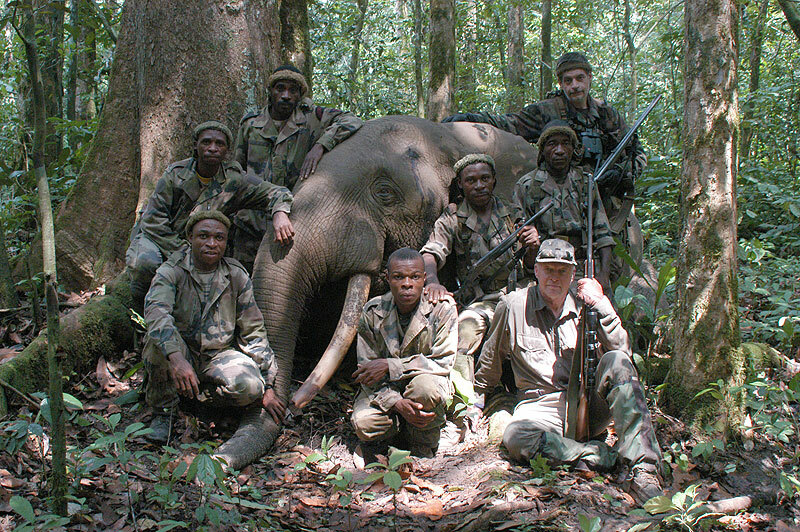 Geoffroy de Gentile and his pygmy tracking team with the author's rain forest elephant - a genuine Kamba Loxodonta cyclotis, as opposed to Loxodonta africanus, the African savannah elephant. 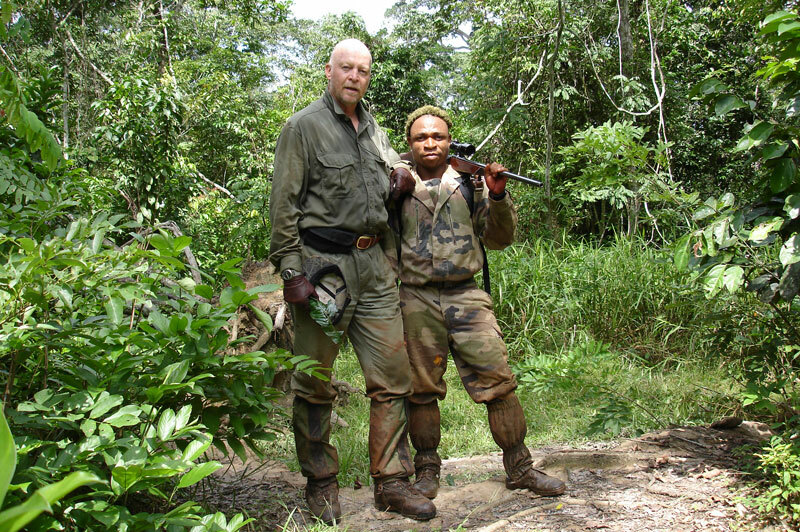 The author and his gun bearer, Mombateau, carrying the author's custom made .416 Rigby topped by a 1.5-6x42 Zeiss Diavari low light scope, an important piece of equipment in the dark rain forest. When hunting in the rain forest visibility is limited to about 30 paces at best and, when you become aware of an animal, you are usually within its fight or flight circle. 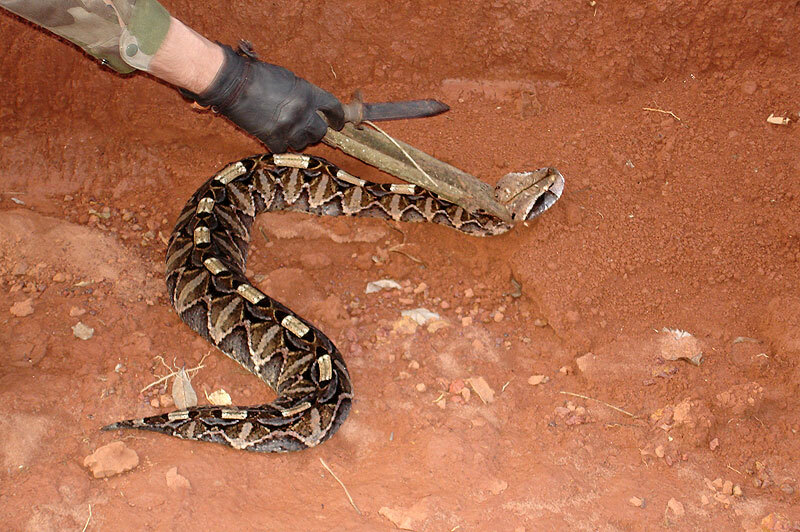 A gaboon viper found alongside the tracks. Article Published in Jagen May 2012. When I awoke to the first ominous signs at midnight, I knew immediately it was something I had eaten or drunk at supper. I also knew it was going to be a long night. For the next five hours my intermittent sleep was interspersed with sprints to the toilet. By 7:00 a.m. the next morning, all I had managed to keep down without mishap was two mashed bananas and a glass of coke. So I felt decidedly fragile when, somewhat later that morning, I joined my PH, the highly experienced Geoffroy de Gentile and his six pygmy trackers, Van Damme, Denis, Mombato, Mongokelli, Josef and Remi – all Baka tribesmen – on the back of his venerable, metallic gold Land Cruiser. We were off to continue our search for a good Kamba – a true forest elephant bull. Loxodonta Cyclotis has a number of obvious physical differences to the savannah elephant, Loxodonta Africanus. The most incontrovertible, apart from size – 2½ to 3 tonnes, as opposed to 4 to 6½ tonnes – revolves around nails. The forest elephant has five toenails on its fore feet and four on its hind feet as opposed to the more usual four and three, respectively, of its larger cousin. Other obvious differences include the shape and girth of the tusks which look as if gravity has pulled them directly earthwards (instead of curving forward), making them progressively longer and thinner, almost like macaroni. When a forest elephant stands erect, it looks as if it is trying to drink water at its feet through a straw, except the straws are tusks. The shape of the ears is more rounded, circular if you like (hence the name "cyclotis"), and different to the "Continent of Africa" shape of the bigger bruisers from the savannah. If possible, I wanted to take back a full skin for mounting purposes because, as far as I could find out, no full mount of a forest elephant existed in South Africa or Africa for that matter. En route to the northern borders of our 250 000 hectare unfenced concession in the rain forests of south east Cameroon, we found our path blocked by a fallen Pemba tree, host to a vicious ant, called Sassa by the Baka, which lives in the hollow twigs and branches of the tree. Try and pluck the pale yellow, apricot sized fruit and see what happens. The ants rush out of the hole you have just created in the twig or branch by picking the fruit and swarm to the defence of their host and bite and sting simultaneously, vigorously and often. As Geoffroy said in his inimitable French accent, "Zay are ze only one who fight ze elefan and gorille wiz out gun an win!" The big elephant tracks we found next to the tree, as we gingerly moved it out of the way, changed our initial plans but, after 2½ hours on the tracks in the stifling, near 100%, July humidity, bending, kneeling, standing and walking as we snipped and hacked our way through the dense forest was too much for my weakened constitution. I called a halt and, dizzy and shaking, sought relief in Land Cruiser power. The next morning I felt much stronger and we went back to the same area as the day before. Sitting in a wooden seat fastened to the front bumper of the Land Cruiser, Joseph, a specialist elephant-poacher-turned-tracker, picked up the tracks of a big Kamba as it gouged a muddy, reddish tan path up an incline to the left of the overgrown logging track we were following. The tracks looked very similar to the ones we were forced to abandon the day before. The heavy thunderstorm the previous evening had been a real stroke of luck but was also the reason we were hunting in July, the wettest part of the hunting season. The rain made the forest animals wet, cold and uncomfortable and they moved out of the continually dripping forest into the more open areas to warm up and dry out. Another by-product of the rain was that it washed away the old tracks and allowed us to move much more quietly through the thick undergrowth. The steady drip drop, tip tap of water filtering down through the layered leaves of the 200 foot high, full canopy rain forest above, also camouflaged what little noise we made when moving through the rain softened, sodden undergrowth. The bull followed a "bimo" (the pygmy word for an elephant highway), through the forest from one choice feeding spot to another, appearing to concentrate on the bamboo trees which produced a yellowy red fruit roughly the shape and size of a small mango. Quite palatable, the Baka say it is "lokoloko" or sweet but the strawberry coloured fruit exuded a whitish paste which acted as a kind of glue and made it very chewy and sticky to eat. We were hunting efficiently and quietly. So quietly, in fact, that we approached to within 15 paces of a tail twitching, minute blue duiker who, oblivious to our presence, bustled and scuttled its foraging way across the forest floor and out of sight. Van Damme and Denis alternated in the lead, followed by Geoffroy, me, my gun bearer, Mombato, and our remaining three trackers. Whenever the tracks became confused, which was not infrequent as there were other elephants afoot, the team would spread out to unravel the problem and communicate quietly via radio with Geoffroy, who listened on an earpiece to reduce the noise. Hunting in the rain forest is like no other hunting habitat in Africa. In my opinion, it is the most inhospitable and dangerous environment on the continent. A fact borne out by the death of Geoffroy’s head tracker of the last five years, Jean Quatre, in the week before I arrived. The dogs had bayed a bongo and the hunting team was running to close in. Jean, being small, fit, fast and keen, was some 40 paces in front of the rest when they heard the elephant scream. Denis said he heard Jean Quatre cry, "The elephant has killed me" and, when they arrived on the scene, they found his body, lying on its back, bruised around the chest and abdomen but without a drop of blood or visibly broken bone. As Geoffroy explained to me, "Ze elephan, e run sroo ze vine, plant and tree as if eet is ze spider web but ze person, e can’t". Admittedly, there are no big predators like lions or hyenas in the rain forest and the leopards are small and few and far between. However, they are not the ones to worry about. It is the micro predators that are the real concern – the fleas, flies, ticks, ants, mosquitoes, bees, millipedes, caterpillars, worms and a myriad of other different insect types, all in their thousands. Each, like Shylock, wants a piece of you and, when they are done, it is the turn of the razor sharp grass, the thorn encrusted vines and spike filled branches, not to mention the poisonous snakes. I can go on and on. Then the big game, like elephant, buffalo and gorilla, are constantly pressured by the commercial, bush meat poachers. Both the forest elephant and dwarf forest buffalo I shot bore fresh bullet wounds from shot gun slugs, one of which we recovered – an imported Prevost from France, not available on the local market. These animals have learnt through bitter past experience that attack is often the best form of defence. When you consider that you and your prey often only become aware of one another at very close range – usually a maximum of 30 paces – which is well within on another’s fight or flight circle, then it is a toss up as to which way the animal will run – at you or away from you. 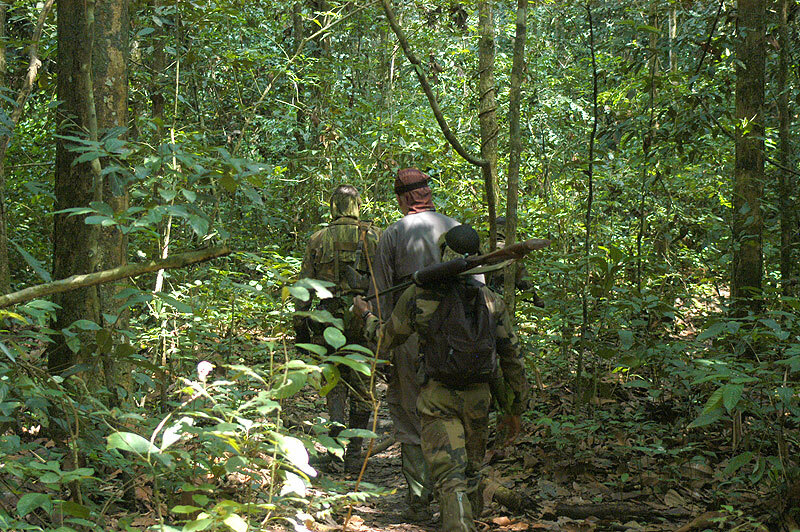 Rain forest hunting requires special clothing, footwear, equipment and skills, which needs an article all on its own. The most important piece of equipment, however, is a mere six inches long and is found between your ears. Although three rain forest hunts do not make me an expert, it seems to me that you hunt the animals in the rain forests with your head. There is not much to see in the claustrophobic confines of the forest. There is nothing to take your mind off the fact that your body is suffering. The micro–predators grind you down and the presence of snakes like the formidable gaboon viper with its huge fangs – we saw three at very close range – can also prey on your mind. I believe that you need to be mentally strong and concentrated to withstand the tensions, pressures and discomforts of the hunt and yet remain alert. According to Geoffroy, you need to do three things well if you want to be successful in the rain forest – walk quietly, walk far and shoot fast. In my book, all three require a certain degree of mental toughness and alertness. We picked up the big Kamba’s tracks at exactly at 6:43 a.m. Don’t ask me why I remember but I do. Originally the pygmies said the tracks were "makala", their word for "right here, right now". Initially we found fresh dung and urine and advanced in a state of heightened alertness, every sense primed and questing. I was tense. Nervous. Worried as to how I would react. Whether I would be able to see enough of the bull to place an accurate shot. Concerned that a poor shot might endanger our team. Intervening vines were carefully and silently snipped or sliced. Denis and Van Damme cupped their ears with their hands and pointed urgently into the forest to our immediate front. Mombato gathered his fingers together in a cone and held them to his nose to show he could smell the Kamba. So could I. The strong, musky odour of elephant was unmistakable. 2½ hours later the machettes had been out for some time and Denis had stopped shaking his forefinger at anyone who took an incautious step. My pulse had slowed to the speed of light. I had returned my .416 Rigby to my gun bearer and was feeling much more calm and confident. Suddenly, Van Damme did an abrupt about turn and came running back down the track passed Geoffroy and I in an uncontrolled rush, the whites of his eyes showing and fear written in capital letters across his face. The "Dicky bird" effect took immediate hold of the pygmies and I just managed to retrieve my .416 from Mombato before he disappeared in a blur of green and black camouflage. The Kamba bull, some 15 paces in front and slightly below us, was small and had even smaller tusks. He was inadvertently heading down the same "bimo" we were on, only in the opposite direction. Still, I suppose if I was unarmed and had lost a close friend and colleague to one of these battleships of the bush less than two weeks previously, well, let’s just say that in any confrontation between valour and discretion, the latter would have won hands down. The second bull we crossed swords with was a much more orderly affair. We were moving through a section of Limbali trees. They have a very dense, hard wood not favoured by furniture makers and are used mainly for railway sleepers. Their price and the distance from a suitable market makes it uneconomical to cut them in south eastern Cameroon and so these parts of the rain forest remain as pristine, with relatively light undergrowth, as they were hundreds of years ago. We spotted the bull at about 30 paces, almost double the distance of our first encounter. "I can’t see the tusks"" Geoffroy whispered in my ear as I tried for a clear shot through the 1.5 x 6 Zeiss Diavari Scope attached to my custom made .416 Rigby (Walther barrel married to a Brno ZKK action) loaded with 400 grain Federal solids. "He is not bad" Geoffroy breathed as, for an instant, the cross hairs locked onto the creases below the ear and behind the elbow of the bull. My forefinger tightened and then, like a lighthouse, the bull was gone. Now you see it, now you don’t. I became aware of Van Damme standing to one side beckoning at us. In French he explained to Geoffrey that this was not the right bull. The track we were following belonged to a much bigger animal. Encouraging, I thought. It was now after 10:00 a.m. Our bull was clearly a traveling man. Turning to Geoffroy I said, "I guess our best bet will be to try and catch up to him while he has his midday snooze". After an hour or so, as if to bear me out, the tracks started to meander to and fro and it looked for all the world as if the bull was looking for a place to rest. We crossed a further two, gravel bottomed, crystal clear rivulets and splashed through the calf deep, gooey grey mud and ooze of four salines before we hit a second section of Limbali trees. One moment Van Damme was walking confidently on the tracks, the next he had disappeared. The five foot tall pygmy crouched low on the forest floor and pointed. Geoffroy bent over his point and beckoned urgently behind his back. As I turned from retrieving my rifle from a by now thoroughly composed Mombato, I caught a glimpse of long, straight, creamy white ivory and knew, without a word being exchanged, that it was time for me to step up to the plate. The bull, burnished a tan brown by the mud with which he was newly caked, was approaching from the left at a brisk walk on the diagonal towards us at a distance of about 30 paces. In the dim darkness of the full canopy some 200 feet above, it was difficult to make out the elephant clearly as his skin colour blended perfectly with the browns and beiges of the ground leaf litter and dark brown, dappled, lichen splashed tree trunks. Only the flashes of whitish tusk through the green on green of shrubs and leaves guided me and enabled me to calculate both the movement and positioning of the animal. The big bull was closing fast. Then there was no more time. He was right there! As the bull started to draw level with me about 15 paces away, I saw his right tusk through a miniscule two foot gap. As his front leg entered the gap, I found my aiming point behind the right shoulder and made the shot I had practiced repeatedly on the range and in my imagination. Re-chambering quickly, I moved around an intervening tree trunk and fired a quick second shot as the elephant bulldozed its way off at a tangent before, as arranged, Geoffroy’s Krieghof open sighted .500 double bellowed and the bull slumped to the shot. Encouraged by him and from where I stood, I placed two shots in the spine region and then, reloading and moving briskly to my right, at an angle of about 30 degrees, I placed a bullet which bisected the brain and emerged behind the left eye socket. And it was probably just as well that I did so. While my first shot bisected both lungs, Geoffroy’s had missed the brain and merely concussed the beast. While the spinal shots may or may not have been effective, the final and fatal last brain shot most definitely was and, by the way the elephant flung his head back at the shot, he may just have been in the throes of recovering consciousness. With that the pygmies went crazy and so did we. They danced, shouted, clasped hands, hugged one another and me. Mombato jumped into my arms to his amazement and mine. Although there was no way of knowing whether this was the selfsame bull that had killed their friend, they firmly believed it was and, at the very least, for them it was like getting back on the horse that had just thrown you to find out, with great relief, that you had lost none of your hard won riding skills. A big forest elephant weighs between 2½ and 3 tonnes, slightly less than half that of an equivalent savannah elephant. So, a forest elephant with tusks weighing 25 pounds a side is probably acceptable. 30 pounds is good; 35 pounds, very good; and 40 pounds and above, exceptional. The bull I shot was left handed and the left tusk was broken off at the tip but, due to the extra work load, was also a bit thicker than its neighbour. They measured four feet eight inches and four feet six inches long, respectively and, according to our Heath Robinson scale, we estimated the tusks to weigh just under 40 pounds each. 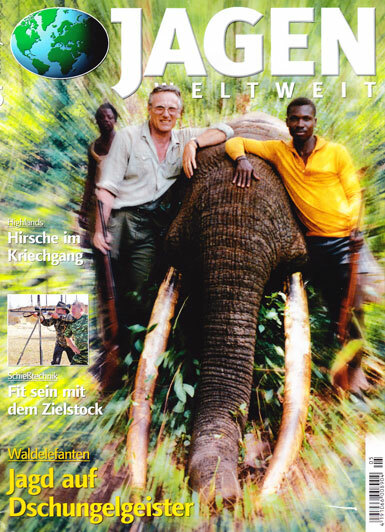 It was the best elephant that a client of Geoffroy’s had ever shot in the rain forests and, over the past eleven years, he had not heard of a bigger one being taken in Cameroon. Although the position of the fallen forest giant made for some good photographs, the entire camp staff could not push it over and, instead of being skinned out from the stomache, it had to be skinned from the backbone down. It was a mammoth undertaking which took a full day and a half in very trying conditions of heat, humidity, flies, bees and rotting meat and gave me renewed respect for my long time friend and taxidermist, Rodney Kretzschmar of Trans African Taxidermists, who volunteered to accompany me on our month long expedition and who supervised the whole exercise. Hunting the dim, dark, recesses of Africa’s rain forests for its special treasures – forest elephant, forest sitatunga, dwarf forest buffalo, giant forest hog, red river hog and the various forest duikers – may not be everyone’s cup of tea but, if canned lion killing ranks at zero in the African hunting scale of 0 to 10, then forest elephant hunting must be right up there at 10. It can only take place on foot and without dogs and, without wishing to gild the lily or sound melodramatic, it is a very exciting, dramatic and dangerous adventure of note. Before the hunt, two professional hunters with more West African, rain forest hunting experience behind them than any other two current hunters, Alain Lefol and Rudy Lubin, both told me on separate occasions (but in virtually the same words), that they thought elephant hunting in the rain forests was the last great hunting adventure left in Africa. With great respect to these two, outstanding professional hunters, I can only agree with them. So sad that you don’t see the beauty of observing these animals and instead seek the thrill of killing these magnificent animals. With supermarkets and other food options abound especially for “civilized” people, this is criminal. Thank you for your note, Nadine. I think it is fair to say that it is hunters like me who probably study the animals they hunt and admire them more than almost anyone else who is interested in wildlife. Personally, I have been passionate about wildlife and wildlife habitats almost all my life and I have spent almost all my disposal time, effort and money conserving them and opposing the things that endanger them. Hunters like me certainly do not kill for thrills but we hunt because it satisfies something deep within us and which has the added benefit of conserving the very animals we hunt. Just a few facts. By the 1960s in South Africa, two animals were already extinct – the quagga and the blue buck. Four others – the Cape mountain zebra, the black wildebeest, the bontebok and the white rhinoceros were following hard on their heels as there were less than 50 of any of these animals. In a 1963 survey conducted in my country, there were less than 560 000 game animals left. When hunting was banned in Kenya, the demand moved south and, suddenly, domestic livestock farmers here were being offered more for a kudu than a cow and hunting in my country grew exponentially. From zero game ranches the number grew to over 10 000 today. Land under game increased to such an extent that private land harbouring wildlife grew to three times all the land devoted to national parks or provincial reserves and at no cost to government. In addition, this land also provided sound habitats for many species of wildlife that were not hunted at all. When the same survey was repeated in 2005, the numbers of game had grown to nearly 19 million animals and those animals of the four mentioned above that had been hunted most assiduously had increased the most. These are not my statistics but scientifically established and empirically determined facts. As for your point about supermarkets, I don’t know if you saw the YouTube clip of Mark Zuckerberg smoking venison in his back yard from game he had shot. When questioned, he said he felt it was important for a husband to take responsibility for what his family ate and, with respect, like him, I and my family prefer to eat wholesome venison, low in fat and salt and devoid of the steroids, growth hormones and anti-biotics found in most supermarket protein products today. And I am not alone as more and more people look to provide this healthy form of protein for their families. And is this not a good thing? 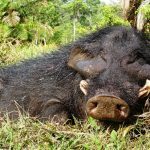 I mean think about it – are cows, goats, sheep and chickens etc., which you find in all supermarkets in danger of going extinct? On the other hand, wildlife numbers in Kenya, which banned hunting in 1977, have dropped dramatically and, by their own admission in a recent scientific paper by four Kenyan scientists, they noted that plains game numbers have dropped by 88% since the ban. In essence, and as is stated by the world’s top conservation body, IUCN (The International Union for the Conservation of Nature), fair chase hunting on a sustainable basis is a cornerstone of conservation in Africa and explains why game numbers in South Africa and Namibia have been steadily climbing for the last 50 years or so to levels not known in over 100 years. Makes you think I hope. If you would like to know more, please email me a postal address and I will send you free of charge the award winning documentary, The South African Conservation Success Story and you can make up your own mind, based on facts, whether hunting is a good thing for wildlife and wildlife habitats or not.